Grinding noise caused by a worn-out fuser drive gear is a common problem with these printers. This gear is part of the swing plate assembly, which contains the black fuser drive gear and a white gear. Usually, you only need to replace the black one; this shorter procedure is available HERE. When both are worn you will need to replace the entire swing plate assembly. Here is how it is done. Cartridge and Cassette. 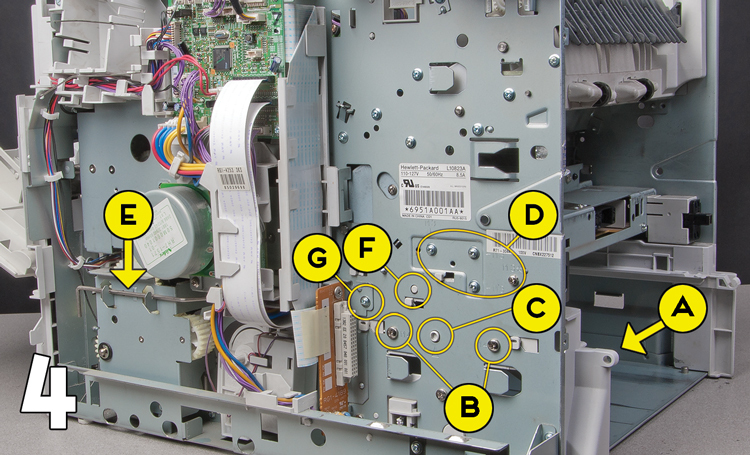 Remove these and put the toner cartridge in a dark place or cover it. Top Accessories/Accessory Cover. Remove any output accessories (stacker, stapler/stacker, etc.). If there are none, remove the top-accessory cover, which is on top, toward the back, by simply lifting it up. There are retaining tabs on each side, but they will release themselves as you pull up on the cover. Duplexer/Duplex Accessory Cover. If the printer has a duplexer, lift it up slightly and pull it away from the printer in the back to remove it. If not, remove the duplex accessory cover in the same way. Tray 2 Extension Door. 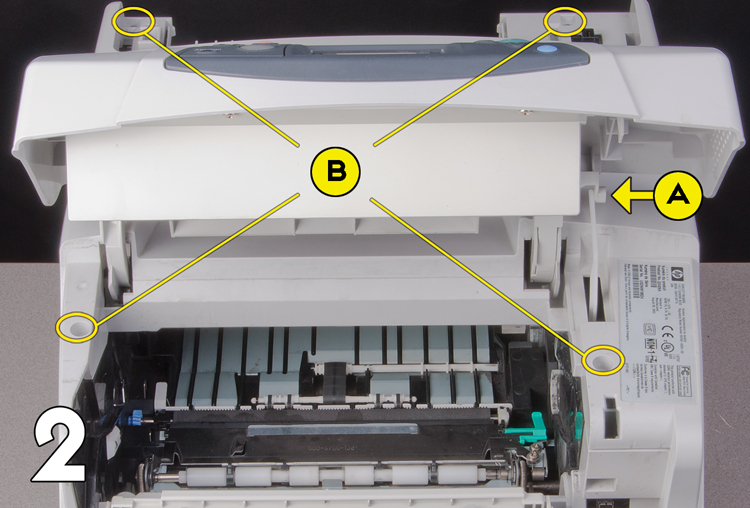 Facing the rear of the printer, rotate the cover up to the horizontal position, and then lift up the right side of the cover to unlock its pivot bar. Then slide the other pivot pin on your left out of its retainer to remove the cover. Rear Output Bin. Open the bin and squeeze the left hinge pin out of its mounting hole (B in Fig. 1). Rotate the bin away from the printer to release the other hinge pin. Fuser. Squeeze the blue fuser release tabs (one on each side) and pull the fuser straight back and out of the printer. 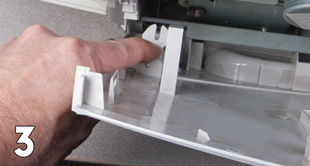 When re-installing the fuser, make sure to push it in until these tabs snap into place. Formatter. First remove the plastic formatter cover (right side of the printer, toward the back) by simply grasping it and sliding it straight back. To remove the metal formatter cage, remove two screws (A in Fig. 1), then grasp the metal cage and slide it straight back. This will require some force, as you are also unplugging a connector. When re-installing the board/cage, you may want to open the metal door on the side of the cage so that you can visually verify correct seating of this connector. Remove Top Cover. Open the print-cartridge door and the front cover. Use needle-nose pliers to release the print-cartridge drive arm from the right side of the cover (A in Fig. 2), and then push the arm down into the printer (remember to re-attach this arm when re-installing the cover). Remove four screws, one in each corner of the cover (B in Fig. 2). Carefully rotate the left side of the cover up away from the printer until you can unplug the control-panel cable from the DC controller board on the right side, then lift the cover all the way off. Remove Right-Side Cover. Release three locking tabs (two along the front edge and one along the top edge), rotate the top of the cover away from the printer, and lift to remove it. 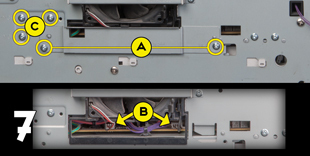 When re-installing, insert the hooks at the bottom first, and verify that the plastic power-switch arm on the cover locks onto the metal switch connecting rod in the printer body (Fig. 3). Remove Left-Side Cover. Release two locking tabs (one along the front edge and one along the top edge), rotate the top of the cover away from the printer, and lift to remove it. When re-installing, insert the hooks at the bottom first. Remove PCA Guide (Fig. 4). To remove the PCA guide (A), remove two screws (B), push in on the retaining button (C), and slide the guide toward the rear of the printer to remove it. Remove Power Supply. On the right side of the printer, remove three screws and a grounding screw (D in Fig. 4). Unhook the metal power-switch rod (E in Fig. 4) from the chassis, and then pull down to remove it from the power supply. Observe how the rod attaches to the power supply inside the paper tray cavity before removing it so you will know where to re-attach it later (Fig. 5). Unplug the two flat cables (A in Fig. 6) and the large DC controller power connector (B) from the DC controller. 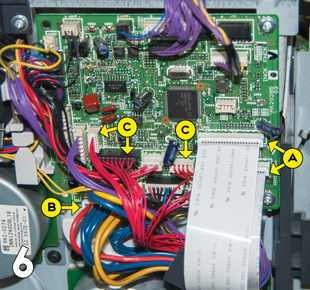 On the 4250 and 4350 only, there are also three extra cables with red wires to unplug (C). The cable with two larger red wires does not need to be unplugged. Unweave all these cables from the cable guides, and feed them through the hole below the power supply into the paper tray cavity. When re-installing the power supply, feed the smaller cables back through the hole first, and then the two flat cables. 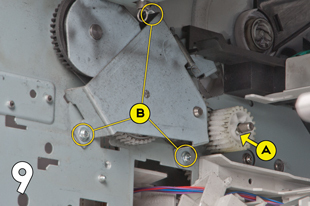 On the left side of the printer, remove two screws (A in Fig. 7) and then remove the fan-cover plate (below the fan). This gives you access to two cables (B). Unplug them, and then remove three screws (C), corresponding to the three that were removed from the right side. Finally, grasp the power supply chassis from behind, lift slightly, and pull it out the back of the printer. NOTE: When removing and re-installing the power supply, take care not to dislodge the small rubber belts and plastic rollers on the feed-guide assembly (mounted to the top of the power supply). 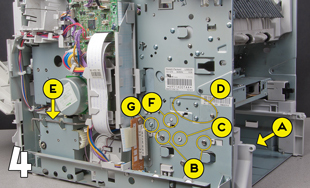 Remove Plastic Guides (Cable, Power Supply, Toner Cartridge). 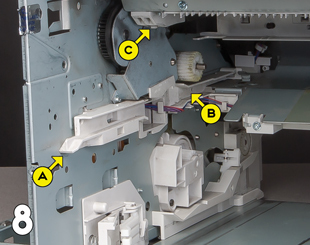 These plastic guides are inside the paper tray cavity in the right rear of the printer. To remove the power supply guide (A in Fig. 8), push in on the retaining button (F in Fig. 4) and slide the guide toward the rear of the printer. On some models, you may have to remove a screw (G in Fig. 4) before you can remove this guide. The cable guide (B in Fig. 8) is secured by a retaining tab at the bottom; use a flat-blade screwdriver or pick to release this, and pull the guide out. You will not be able to remove it completely without unweaving the cable, but this is not necessary – you can just allow the guide to dangle. Finally, the toner guide (C in Fig. 8) is secured by a spring that attaches to the printer chassis. Use a spring hook to detach this spring from the guide, and the guide should just fall out. Remove Swing Plate Asm. First, remove the white gear that overlaps the front of the assembly by pulling the small retaining tab (A, Fig. 9) away from the metal shaft and sliding the gear off. Then remove three screws (B) and pull the swing plate assembly out. 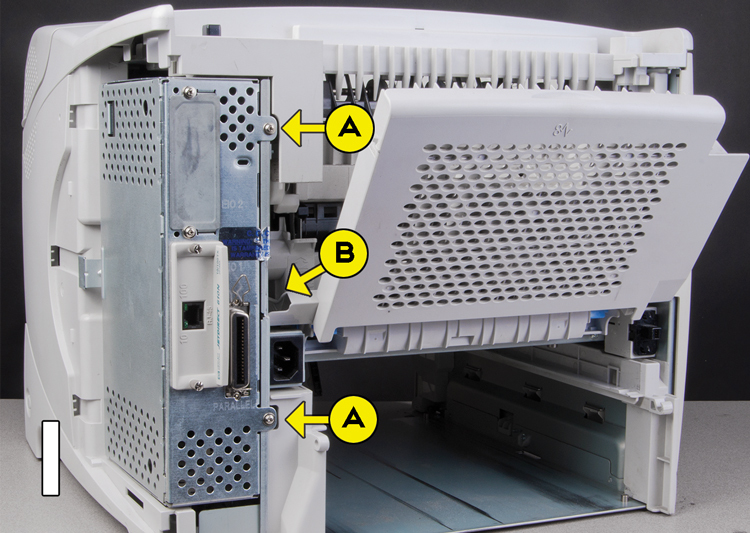 When re-installing the new swing plate assembly, make sure that it is mounted flush to the printer chassis, and that the swing arm moves freely. Reassemble. Reverse the above steps to re-assemble the printer.